Yes, WANTED: A Wild Western Adventure features stylized 3D graphics that are very different from the graphics in a typical adventure. Yet this works somehow. More than that, it works well. The world is colorful and pleasant and the characters are lazily endearing. They make you laugh. There are ambient effects – flags that sway in the breeze, fountains, butterflies – that add their own color to the world. The music is cheerful and vaguely western, and the tunes pop back into your head even after you’ve left the game. The gameworld isn’t vast, or photorealistic – but it is a fun place to spend a lazy afternoon (given the game length, several lazy afternoons). Picture a colorful 3-D comic book, set in the Old West, with Guybrush Threepwood in the role of a wannabe cowboy instead of a pirate. Our hero Guybrush (oops, I mean Fenimore Fillmore) has wandered into the middle of a dispute between ranchers and farmers in the Old West. The villain is a ruthless rancher with an eye towards taking over the entire town. And the outskirts of the town. And all the farms past the outskirts. And after that…. Fenimore is a helpful, polite, likeable guy, and he certainly doesn’t lack for courage. In fact, I did wonder about his willingness to take on such a dangerous challenge. Is he doing it because he’s naïve? Or because he knows that what he is doing is right? Or because he lacks good judgment? Is That a Wheelbarrow in Your Pocket? WANTED is a traditional, third person perspective, inventory-based adventure game. It features a simple point-and-click interface, with puzzle challenges and lots of humorous character interaction. Left-clicking on an object allows you to look at it. Right-clicking on the object usually gives you the option to use it in some way. The inventory is easy to use – its only oddity (and for purists, this may constitute a HINT) is that if you use a reusable item, it doesn’t always automatically return to inventory – sometimes it stays in the location where it was used, and you have to pick it up again. The inventory holds lots of items, and I found myself frequently wondering how on earth some of this odd stuff was going to be used. Fenimore folds large objects into his pockets with expert flair. I particularly enjoyed watching him deal with the wheelbarrow. To help you move from place to place, the game brings up a 3D map of the gameworld, also reminiscent of the Monkey Island games. You can see smoke rising from the chimneys on the map. Lower left is a miniature waterfall tumbling over the rocks. Fenimore trots his horse as he starts out, then gallops along the colorful mapscape. It’s very well done. You cannot die in the game. Our hero is either amazingly strong or made from tightly coiled rubber springs. There are many real rodeo cowboys who would give their eyeteeth to have Fenimore’s bounce-back-ability. Our hero’s ego actually takes much more bruising than does his body. WANTED spends a goodly amount of time poking fun at wild western stereotypes. But despite its cartoonish nature, it does a pretty good job with developing the main characters. I particularly enjoyed the spunky heroine, and wanted to see more of her. The banter between Rhiannon and Fenimore during the “examination” is full of wit and zing, and reminds me of the wacky strip search in Grim Fandango. 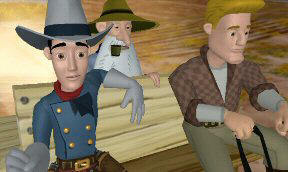 My favorite minor character was the sheriff, who surely was modeled after an adventure gamer. He spends most of the game sitting at his desk, taking notes and mulling over various clues. When he finally does investigate, he has a genius for looking in all the right places for all the wrong evidence. Yes, I admit that this was the character with whom I most identified. Voice acting is good, though occasionally campy (which was just about perfect for this game). Much of the character animation has an impish, tongue-in-cheek quality, with attention to eccentric details. The expression on Fenimore’s face after the Tyrolean harness incident, for instance, or his highly unorthodox way of sliding down a telegraph pole – all draw you into this world of whimsy. The game is radically nonlinear. At almost any point in it, you can think of at least two missions/tasks you could be addressing. This is effective for the most part, though it does require some thought to keep track of the various puzzle/plot developments. Nearly all the puzzles are fair, and some are unusually creative. I found this to be a difficult game. Its nonlinear character allows you to solve several puzzles and get deep into the game before you get stuck. But as you near the end of the game, you begin bumping up against the challenges you have (so far) failed. Several times I found I could not progress in the game. In each instance, it was either because I hadn’t listened closely to a bit of dialog, or because I had missed a small detail in the game environment. WANTED’s cheerful lightheartedness makes its difficulty level an unexpected surprise. Suffice it to say that, while I thought the game’s puzzles were pretty easy for the first few hours I played it, by the last few hours I was feeling distinctly challenged. The game is long, with plenty to do in the course of your adventure. However, the locations you visit are limited and you keep returning to the same places as you progress though the story. Load times between locations are also long and you’ll find yourself staring at a blank blue screen for several seconds as you enter each area. So I Have to Plant the Carrots? WANTED has a taste for genre fusion, and this leads to my most serious reservations about the game. There are arcade elements and RPG elements. (Yes, I didn’t quite believe the RPG stuff at first either.) The RPG challenges are not particularly difficult – you have to manage money and you have to manage carrots. At first I thought the management aspect was cute. But it didn’t take long before it became seriously annoying. Going back time and again to the drawer where money grows was unnecessarily repetitive (though I would very much enjoy seeing dollar bills regenerating themselves this way in MY side table drawer). Anyway, that was nothing compared to the trouble caused by the carrots. Carrots are the fuel that get you from place to place, as they are the only thing your horse will eat. You can acquire carrots through harvesting, purchasing or begging. It takes 30 mouse clicks to grow a batch, and the process is slowed by having to watch animations in between the clicks. By game’s end -- as you travel back and forth trying to figure out what inventory item or bit of dialogue you’ve missed -- the carrot business develops into a major saddle sore. The game also features five arcade-like challenges – four shooting sequences and one “swishing” sequence. Only one of these seriously tests your reflexes – though the others require the right strategy and fairly good hand-eye coordination. It was the swishing sequence I spent the most time on, because I simply couldn’t figure out what it was I was supposed to do. Of the shooting challenges, by far the most difficult is the shooting gallery. This is considerably easier to beat if you change one of the game options in the Options menu, and if you arrange to sabotage something before the shooting begins. It’s still plenty difficult though. I beat it twice, but it took almost ten attempts each time before delicious victory was mine. In many ways, this is a fun game to play with your entire family. That is, of course, if you don’t mind a few mildly off-color jokes – and if you don’t object to letting the kids shoot at people and things on screen. The bright graphics and Western theme appeal to many age groups. In fact, this review was somewhat delayed by my difficulty in getting the rest of the family to stop playing the game so I could. Cutscenes in the game are absolutely hilarious. We watched and played the entire end sequence with its long cutscenes and final showdown over and over. The outtakes at game’s end are wonderful. You definitely leave this game with a big smile on your face. 3D cartoon-style adventure featuring a hero who yo-yos between gunslinging competence and comedic humiliation. Point-and-click (mouse controlled) interface, third person perspective. Colorful graphics. Humorous dialogue. Excellent voice acting. Hilarious cutscenes and outtakes. Nonlinear gameplay. You cannot die in the game. Inventory challenges, a dialog-based insult challenge. No sliding tile puzzles, sound puzzles or mazes. RPG elements and arcade elements, which are sometimes quite frustrating. Unlimited save slots. No glitches or other technical problems. WANTED aims to please fans of the old Lucas Arts adventures, particularly the Monkey Island crowd. For the most part, it succeeds.